The Swingline™ CM11-44 is perfect for shredding large paper types due to its wide feed opening. The Swingline™ shredder is TAA compliant and can shred paper, optical media, credit cards, staples, and paper clips. 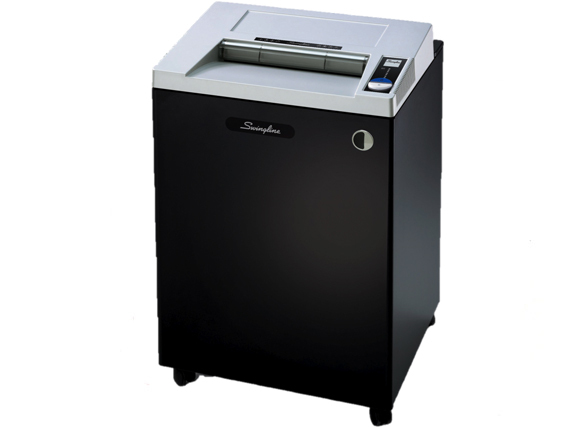 The Swingline™ shredder is a micro cut shredder; being more secure than cross cut. The Swingline™ CM11-44 micro cut shredder incorporates Swingline™'s JamStopper® technology to tackle paper jams; automatically reversing during paper jam. The Jam Stopper® shredder features thermal overload protection and continuous duty shredding. The Swingline™ CM11-44 micro cut shredder comes with a large waste bin; saves costs as the bags won't need to be changed regularly. The Jam Stopper® shredder indicates when the bag is full. Wide feed opening makes it perfect for shredding large sized documents.